Geocaching is an outdoor adventure game similar to a treasure hunt played with a GPS device. The basic idea is to locate hidden containers, called geocaches, then share your experiences online. There are over a million active geocaches around the world and now, with the RiverWalk GeoTour, there are even more reasons to bring the family and hike along the Chattahoochee RiverWalk; check out the longest urban whitewater course as well. Hiking, biking, and now kayaking! Family fun for everyone! Obtain a RiverWalk GeoTour Grid Sheet from Visit Columbus, GA (900 Front Avenue 31901) or download it online by clicking here. If you are not already registered to geocache, go to www.Geocaching.com, create a log-in and find the GPS coordinates and additional information for the RiverWalk GeoTour locations. Start your search and locate one or all caches using a hand-held GPS unit. The cache containers are labeled as a RiverWalk GeoTour geocache. Caches are located in 32 points along the 15-mile Chattahoochee RiverWalk in Columbus, GA. 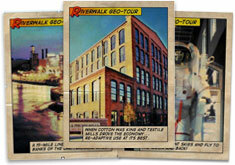 When you find a RiverWalk Geo-Tour cache, log your name and any comments on the logbook inside the container. Also, fill in your RiverWalk Geo-Tour Grid Sheet with the letter unique to that particular cache, also located within the container. There are 5 to 6 caches in each of the series. Collect one or all six cards. 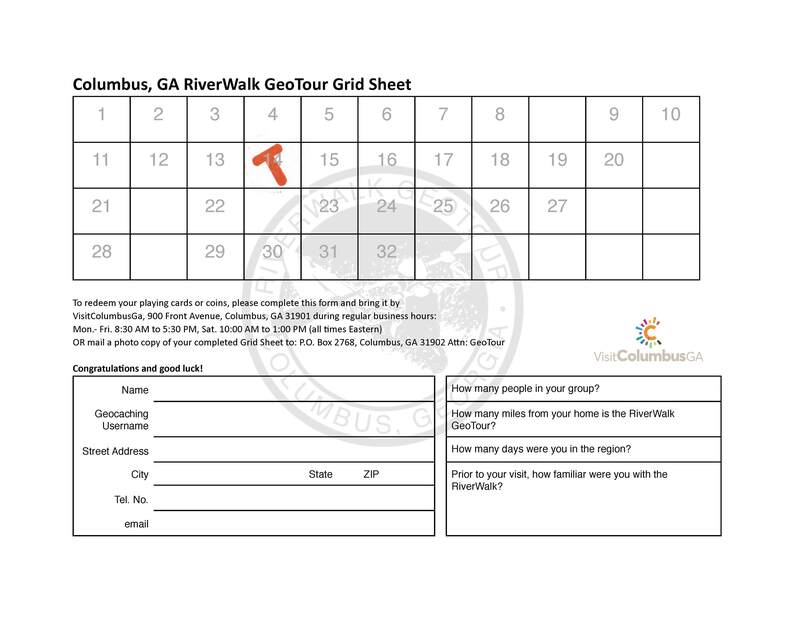 Simply present your RiverWalk GeoTour Grid Sheet with the appropriate spaces filled in at Visit Columbus, GA during regular hours. Bring your completed Grid Sheet into Visit Columbus, GA during regular hours to receive your coin. With any 10 completed caches you are eligible for a bronze level coin. With any 20 completed caches you are eligible for a silver level coin. With 30 completed caches you are eligible for a gold level coin.